The London terrorist attacker has been named by police as Khalid Masood. Masood, 52, was born in Kent, and detectives believe he was most recently living in the West Midlands. Masood was also known by a number of aliases, Scotland Yard says. Masood was not the subject of any current investigations and there was no prior intelligence about his intent to mount a terrorist attack. An anonymous US government source told Reuters that Masood never traveled abroad to join a jihadist group. He was known to police, however, and had a range of previous convictions for assaults, including GBH, possession of offensive weapons and public order offenses. He had never been convicted for any terrorism offences, police say. According to Sky News, Masood was an English teacher and religious convert. He was a married father of three, who was into bodybuilding. Masood was born Adrian Elms and raised by a single mother in the English coastal town of Rye, according to the Daily Mail. Westminster attacker Khalid Masood was an English teacher and religious convert, sources tell us. Sky sources: Westminster attacker Khalid Masood was a married father of three, who worked as an English teacher and was into bodybuilding. 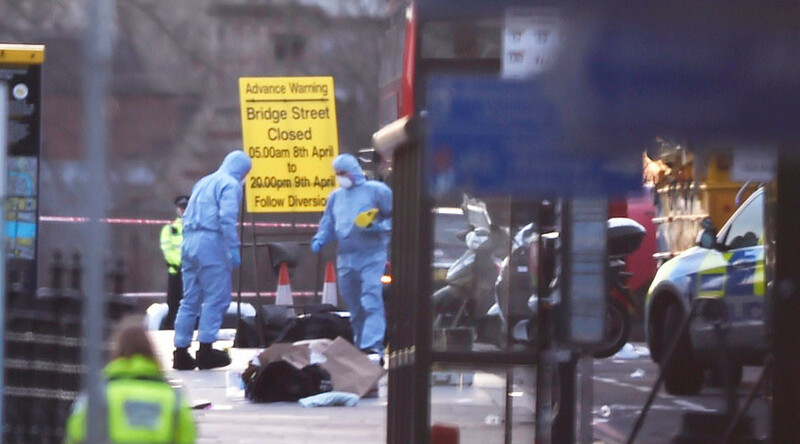 Masood killed four and injured 29 people in a terrorist attack in Westminster on Wednesday. He rammed pedestrians while speeding across Westminster Bridge in a car, then ran towards Parliament and stabbed a police officer dead. Masood was shot dead by an armed police officer outside Parliament. Giving details of the attacker’s background in Parliament today, May said the assailant was known to police and MI5 – the UK’s domestic intelligence agency. “What I can confirm is that the man was British-born and that – some years ago – he was once investigated in relation to concerns about violent extremism. He was a peripheral figure. In Birmingham, searches are continuing at a flat raided by armed police. The rental car Masood used to carry out the slaughter was from an Enterprise branch in Birmingham, according to Reuters. There are reportedly more than 213,000 Muslims living in the city, where 39 of 269 people convicted in Britain of terrorism charges between 1998 and 2015 hailed. Neighbors said heavily-armed officers stormed a second-floor flat in Hagley Road overnight. “The man from London lived here. They came and arrested three men,” a witness who works in a shop nearby told the Press Association. A total of eight suspects have been arrested in raids at six different locations. The attacker is believed to have acted alone. Islamic State (IS, formerly ISIS/ISIL) has claimed responsibility for the attack outside the UK parliament, according to the terror group’s new agency Amaq. The agency said “A soldier of the Islamic State carried out the attack, responding to a call for attacking citizens of coalition states." The claim cannot be verified at this stage.